Arauco Colors Matching PVC Edgebanding - EdgeCo, Inc.EdgeCo, Inc.
Over 125 Arauco Arauco-Flakeboard Edge Banding Color Matches in Stock for same day shipping. Arauco Finishes include: AuthenTICK, Suede, Satin, Algonquin Ash, Woodgrain Gloss, Medina, Timberline, Sacut, Cascade, Taction. EdgeCo matching stock program is inventoried by the most popular finish per color. All colors are inventoried in the size of 15/16 x 600′ x .018 and many popular closet and storage system colors are also inventoried in the size of 1mm 15/16 x 300′. Additional sizes and thickness are produced to order. Over 1800 in stock PVC Edgebanding: Colors Matching: Abet Edge Banding – American Laminates Edge Banding – Arauco – Arborite Edge Banding – Arpa Edge Banding – Dixilam – Duramine Edge Banding – Arauco-Flakeboard Edge Banding – Formica Edge Banding – Funder Edge Banding Edge Banding – KLM – Laminart – Nevamar Edge Banding – Panolam – Pionite Edge Banding – Pluswood Edge Banding – Premoule Edge Banding – Roseburg Edge Banding – Stevens Edge Banding – Tafisa – Uniboard Edge Banding – Wilson Art Edge Banding. Metallic Edgebanding: Real Metals and Mylar in: Brushed Aluminum – Polished Chrome – Stainless Steel – Brushed Brass – Polished Brass. 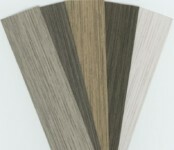 Wood Veneer Edgebanding: Over 50 species from Anigre to Zebrawood. With or without hot melt adhesive. Wood Veneer Sheets: Over 50 species from Anigre to Zebrawood. Glue for Automatic Edgebanders: Pellets or Cartridges – Low Melt for Contour edgebanders – Natural – Clear and Colors. Other Edgebanding: 1mm, 2mm and 3mm PVC and Thick Wood – Iron On Melamine – Custom Matching Production Runs. Custom Stain Prefinished Wood Veneer edgebanding. In House Services: Edgebanding converted to Peel and Stick and Hot Melt Adhesive applications. Slitting to width from Master Rolls.